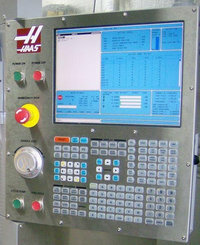 If your Haas CNC has some problem such as cannot power on/ turns off by itself/ keyboard beeps then here are few troubleshooting steps that you can take. WARNING: Some mechanical and electrical service procedures can be extremely dangerous or life-threatening. Know your skill level and abilities. CAUTION! Working with the electrical services required for the machine can be extremely hazardous. Machine cannot be powered on. Machine can be powered on, but turns off by itself. Machine turns on, keyboard beeps, but no LCD/CRT display. Machine turns on, LCD works, but keyboard keys do not work. Constant E-Stop Condition (will not reset) (Vertical Machines). Check input voltage to machine. Check main circuit breaker at top right of electrical cabinet; switch must be at the on position. Check wiring to Power Off button on front control panel. Check wiring to Auto Off relay to I/O PCB. Check connection between 24V transformer (T5) and K1 contactor. Check 24V transformer (T5) bracket has jumper in correct position (measure voltage at main circuit breaker and connect jumper to corresponding connector on T5 transformer bracket). Check Settings #1 and #2 for Auto Off Timer or Off at M30. Check alarm history for Overvoltage or Overheat shutdown. Check AC power supply lines for intermittent supply. Check low voltage power supply for intermittent supply. Check connection between 24V transformer and K1 contactor. Check Parameter 57 for Power off at E-Stop. Check MOTIF or MOCON PCB. Check for power connections to LCD/CRT from I/O PCB (LVPS power from Power PCB for 15” monitor). Check for green Power LED at front of CRT. Close doors and zero return machine (possible bad monitor). Check video cable from Video PCB to LCD/CRT. Check for lights on the processor. Check keyboard cable (700) from Video to SKBIF PCB. Check hydraulic counterbalance pressure, low pressure switches, and cabling. The Quad APC uses an additional PC board to control pallets 3 and 4. The pallet chain motor receives 160VDC from plug 6A on this board (32-3078A). The PC board receives power (115V) from the power card, which plugs into P4 on the APC board. The solenoid for the left, air operated, automatic door plugs into P3; this cable is part of 33-6038A. Pallet 3 and 4 signals are sent through cable 33-1516, which plugs into P1. The cable’s other end plugs into the I/O board P62. You bought a (cnc) machine for your workshop, or you just want to move machine to a new corner in workshop. Here is a very basic technique to move machine….